25 years, 3 months, 20 days old age. Pooja Dhanda will turn 26 on 01 January, 2020. Only 8 months, 10 days, 7 hours, 32 minutes has left for her next birthday. Pooja Dhanda has celebrated the total number of 25 birthdays till date. See the analysis by days count and bar graph. Pooja Dhanda was born on 01-01-1994 in Budana, Hisar in the state of Haryana, India. She is an Indian Wrestler. Pooja Dhanda is an Indian wrestler who begins her career as a Judo player and bagged three international medals in judo also a silver medal at 2010 youth Olympics and later on shifts to the wrestling in 2009. 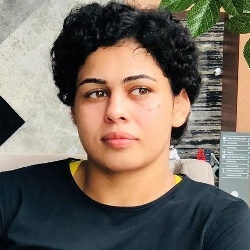 After her entry in a national championship in 2013, she had beaten Babita Phogat in the final and also won all the national championships by the year 2017. She appeared in pro wrestling league and had twice defeated World and Olympics Champion Helen Maroulis of USA, World Champion silver medalist, World Champion silver medalist Marwa Amri and Olympic bronze medalist Odunayo Adekuoroye of Nigeria. In 2010, Summer Youth Olympics in Singapore she bagged silver medal in the girls' freestyle sixty kg event, from Baatarzorigyn Battsetseg of Mongolia in the final. In Commonwealth Games at Gold Coast, she had acquired the silver medal in the women's 57 kg freestyle wrestling from Nigeria's Odunayo Adekuoroye 7-5 in 2018 and also in the final match at the Carrara Sports Arena. She was born to Ajmer Dhanda and Kamlesh Dhanda in a Hindu Family. Her father works in the Animal Husbandry Department as a tractor driver and her mother is a homemaker. With the advice of Kripa Shankar Bishnoi, she joined wrestling. She was selected for the role of Babita Phogat in Dangal that she did not play due to the knee injury. Pooja got a knee injury, which forced her into a healing stage for almost 2 years. First woman to win the world championship Medal for 6 years. Pooja knee surgery got wrong in Haryana then she had done her third-second surgery in Mumbai. It was very difficult for her to survive in Mumbai. Sports Authority of India helped her with two lacs.